Sample a chapter from the upcoming Agents of A.S.S.E.T. Series. 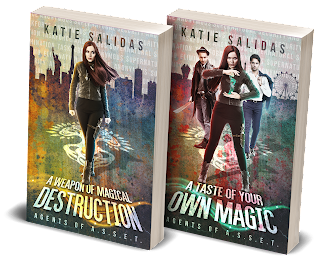 Book 1 - A Weapon of Magical Destruction releases on June 5th 2018! The murky despair of ASSET’s conference room faded into the darkness as Sage drifted from reality. Dazzling colors exploded across a cloudless evening sky, and Sage found herself standing atop a hill as a rainbow of glittering specks fell around her. Great blooms of blue and then red, orange, and purple made for a spectacle that reminded Sage of her childhood. Her mom had always found the best places to watch the fireworks show. Sage followed the glittering trail of the last explosion as it faded down to the earth. Expecting to see families lying on blankets, grills filled with burgers and hotdogs, and the gleeful expressions of children admiring the Fourth of July celebration, Sage shrieked in horror at the sight of bodies, disfigured and bloody, carelessly heaped into piles amid a raging battlefield. The air escaped from her lungs and refused to return. Frozen where she stood, the only thing in motion was her heart, pounding ferociously against the walls of her chest as if it knew it had to escape, even if her body could not. Magic crackled in the air overhead. Lightning flashed across a cloudless sky and then speared the earth below, shattering the ground where it struck; all that remained after was a great singed hole. Her initial shock morphed into fear, as war cries in languages she’d never heard before rang out. A stranger in an even stranger land, Sage didn’t know whether running or hiding were viable options. Fighting armies clashed against each other everywhere she looked. Even if she could run, where could she go? On a hill to her left, cavalries of beast riders mowed down warriors carrying shields of soft, silvery light. They marched into what might have once been a beautiful meadow ringed with distant mountains. But ravaged by war, the gentle carpet of grass had been burned away, leaving dry, crumbling earth. Once-proud mountains had shattered into skeletons of their former glory, leaving little more than gnarled fingers of rock jutting up from the ground to grasp at the stars. This world looked so much like Earth, but felt primordial. Stranger still, these armies fought with magic, a thing of fantasy in her world. She had to be dreaming. Lucid as she was, this felt too much like her weekly game night raiding party, though far more realistic than role-playing with wooden swords and casting spells with made up words. It had to be a dream, and that thought calmed her racing heart. She found her breath and tried to let herself experience the world her imagination had summoned. Sage recognized the mighty centaurs charging into battle. Their enemies were equally familiar creatures from the supernatural realm: werewolves. Men morphed mid-stride into great snarling wolves the size of baby elephants as they met the oncoming charge from the centaurs. In the distance, cresting the top of a shattered hill, an entire army of grey-skinned foot soldiers marched into view. Each of the giants – or maybe they were trolls – carried weapons she had never seen before: guns with numerous gaping barrels. Blasters of corruption, she named them, thinking they’d be handy in her next dungeon raid. As if conjured from the very air, the giant trolls swung their arms forward, and from the mouths of their oddly shaped artillery sent a volley of glittering death raining down on the cavalry approaching them. No banners; no sigils; nothing distinguished the fighting camps from each other; just magic and death. When a body fell, it was tossed aside to make way for the next soldier as the army continued its march. Magic and death. The words formed and took root within her mind moments before a cloaked figure in blue blinked into existence. Sage shrank backwards, shock kicking her heart into overdrive. At this pace, her chest threatened to burst like the magical fireworks still blooming overhead. A moment of silence had Sage trembling in terror as she struggled to control herself. The cloaked figure exuded a confidence that needed no words. Beyond the darkness of its hood, Sage could feel eyes regarding her, scrutinizing her, assessing whether or not Sage was worthy. Sage opened her mouth, not quite knowing what to say. Peace. Friendship. Surrender. Anything to avoid her body being piled with the rest. But before the sound could leave her throat, the figure extended a pair of blue hands. A gesture of friendship? Sage reached out to grasp them. A ball of energetic light flickered between the cloaked figure’s palms. Sage wrenched her hand back, afraid to be burned as the ball grew into an electrified sphere. Amazement held Sage in stunned silence. Magic. Real. And happening right before her eyes. Electricity glowed blue and then white. Flecks of purple glittered as it arched within the invisible confines of the magical sphere. Like liquid crystal, the outer edges of the ball moved and shifted, all the while maintaining the spherical shape as the cloaked figure held it suspended between its hands. Once the ball was fully formed, the cloaked figure threw it at Sage’s feet. Instinctively she hopped backwards with a squeal. It landed with an explosive burst that singed the blades of grass to fine ash. Why? The question hung in Sage’s mind, but her lips trembled too much to ask it. Blood. Death. Destruction. Sage heard the words form in her mother’s voice, as if whispering in her ear. The result of war fought with magic. The cloaked figure laughed, a raspy sound, sending icy chills down Sage’s spine. It pulled back its hood, and shimmering eyes of the deepest blue glared at her with a silent threat of death. Those eyes should have been red for all the raw fury she felt under the weight of their piercing glare, but the magical creature threatening to unleash another attack was the essence of blue – as blue as the most beautiful sapphire, with subtle shimmers of purple and sliver flecks in its long hair. She found it hard to tear her eyes away from the gorgeous creature. How could something so beautiful be so deadly? Gone were her initial feelings of awe. She’d have given anything to return to her safe and mundane home where the only crazy things that happened were on game night. 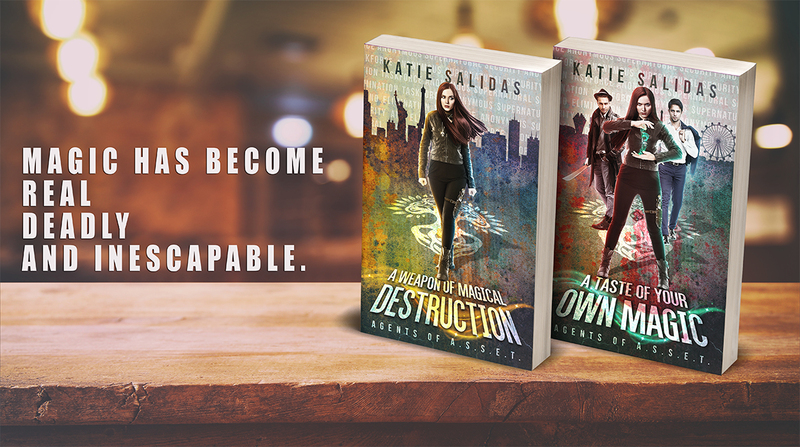 Another sizzling softball-sized charge hit the ground at her feet, making Sage skip backwards. Thankful the magical assassin had chosen to make her dance instead of killing her outright, she couldn’t help but feel the creature was toying with her, prolonging the moment of her death for when it suited the creature best. She should run? Live to fight another day? 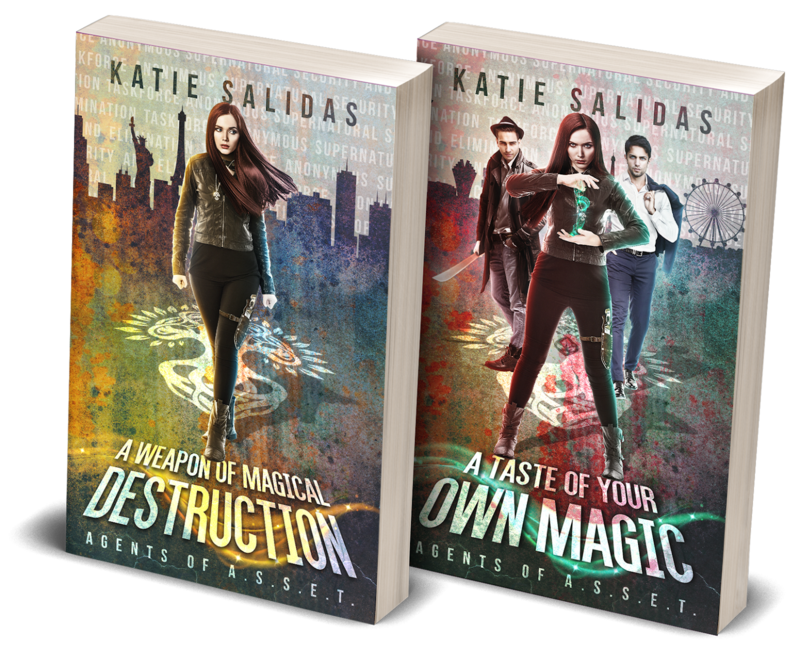 Sage’s subconscious screamed for her to do something, but could she really outrun magic? Across the wasteland, another arc of lightning appeared from the cloudless sky, splintering into three branches before striking the ground below. Standing underneath the deadly trio of ethereal energy, Sage saw her mother: Miranda Cynwrig. Long red hair braided for battle, wrapped over her left shoulder; her trademark look. Always there when Sage needed her; her own personal superhero. Alive and ready to fight! The only thing missing was a billowing cape behind her. Seeing Miranda standing amid the magic and fighting, unharmed and ready for battle, bolstered Sage’s courage. No matter how bad things looked, Mom would save her. From across the expanse of wasteland, their eyes met. Miranda opened her mouth, but no sound made its way to Sage’s ears. In her mother’s hands were twin daggers, held ready to fight. Another strike caught Sage unawares, pushing her back even farther than the last one. Four, maybe five more steps and she would fall. Her plea was met with another explosion of energy at her feet. 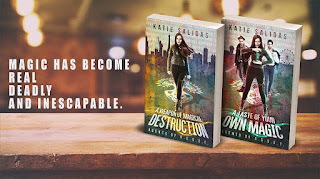 Sage looked desperately toward her mother, but Miranda had vanished, just like magic – there one second and gone the moment its force had been used. I’m dreaming. This is only a dream! Wake up! Sage pinched herself, but that didn’t rouse her. She had to escape this world before it ended her. If you die in a dream, you die in real life – that was the story she’d always heard. And damned if she was going to die in fantasy land. She tried again…harder! Nearly sending her nail through her skin, she pinched herself so hard her eyes watered, and an involuntary squeal erupted from her mouth. But pain refused to send her back to the real world. Another strike nearly took out her foot. Sage jumped backwards instinctively, without looking where she was heading, and found herself teetering on the edge of the world. Wind-milling her hands as fast as she could, she threw her weight forward. Heart racing, she crashed and pawed at the ground. Desperate not to fall, Sage dug her nails into the burnt, black dirt, clinging to the earth for dear life, all the while praying to any gods that might listen to get her out of this. She allowed herself a peek over the edge. Emptiness ran further down than she could possibly see. Nothing but the blackest of black. Another strike of energy hit just shy of her fingers, and she felt the sting of errant electricity and cried out with more fear than pain. She had nowhere to go. If she fell, she’d surely die. But if she were struck by the creature’s energy, she’d surely die. Face your enemy. Show them no fear. Sage’s mother whispered the words inside her mind, urging her to be strong. She looked up, expecting to see the sapphire eyes of her killer. “Do it!” But the face of her mother came into view instead, bathed in the brightest of white light. Sage could barely make out her features, but intuition filled in the gaps where her sight failed. A smile. A promise. A flash of that brilliant light enveloped them both. It all happened so quickly. Tingling waves like tiny pinpricks of static electricity crawled harmlessly over her skin. Splayed out on the mangled earth, Sage was conscious of the fact she had been struck by something, but death had not come to claim her. Nor had she returned to her own reality. The tiny charges of electricity left their warm fingerprints all over, and her skin drank in the heat. Light wrapped around her with all the physical strength of her mother’s arms, lifting and embracing Sage in a loving hug she didn’t realize she needed and prayed would never end. Words echoed in her mind, in her mother’s voice. I am with you, always. Miranda’s light flickered, dimming as it began to merge with Sage. She couldn’t stop it or break free from her mother’s fading embrace. Drinking it all in, Sage’s body pulled in the essence of her mother’s fading spirit, giving it permanent residence within her heart. Miranda had gone, leaving only a small ember of white light floating in midair. Magic and death. The words echoed again as tears streamed down Sage’s face. She reached out her hand toward the tiny speck, not wanting to let go of her mom. She couldn’t reason why, but this meeting felt like a true goodbye. The ember touched down on her wrist, and its kiss burned like wildfire. Sage hissed as her skin singed, and the ember branded a tree into the spot where it landed. Magically twisting branches expanded into a glorious canopy on top, and then below, straggling roots dug deeply into her veins, tapping into the red of her blood to color the mark. She screamed, but the sound that reached her ears was not her voice. A man was calling out her name. His voice was familiar but hollow, and almost a whisper, as if from a great distance. Pain riveted her eyes to the markings that were etching into her skin. Around the canopy of twisting tree branches, leaves began to appear in a semi-circle crowning the great tree. Once all had been formed, the light and heat faded into memory, leaving only the branding of that tree as a reminder. She heard her name again, louder this time. When she looked up, the battlefield had disappeared. Standing before her was a tree, matching the one scarring her wrist. Large as a skyscraper and wider around than any she had ever seen, she was forced to step backwards to take it all in. The land around her was empty; the valley lush and green. All signs of the previous battles had vanished, and a bright sun shone overhead, its light twinkling through the canopy of leaves. Sage would have loved to say and explore, but the cry of her name on the wind demanded she listen. Louder and louder the voice called out, demanding she find it and answer. Sage shut her eyes and covered her ears, but her efforts gave no relief from the sound. Her head throbbed and a fierce headache threatened to split her skull in half. Once more the voice called out her name, and with a frustrated cry, Sage opened her eyes. “Sage, are you okay? Speak to me!” Mark’s voice resonated with fear more than concern as he repeated the command over and over, demanding her response. Sleep clouded her vision, and at first she couldn’t tell which realm she was in. The dream had been so real; but at least there she had felt a connection to her mother. Now all she felt was pain – her head throbbing, her wrist burning. She focused through the pain and found Mark staring down at her. His brow furrowed as he stared at her wrist. “Please let this be a nightmare too,” Sage whispered like a prayer.